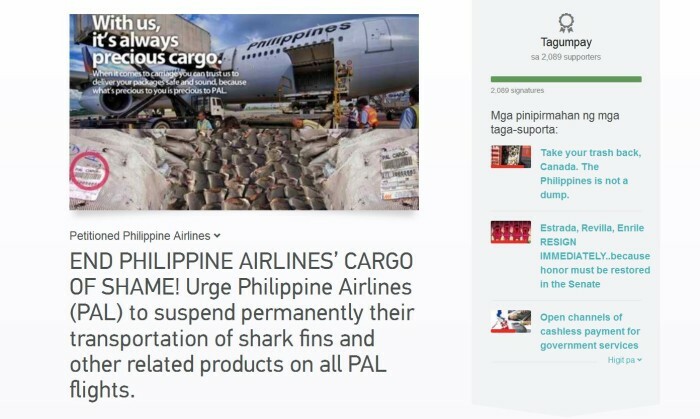 Flag carrier Philippine Airlines (PAL) will be banning the shipment of shark’s fins and related products in response to an online petition from marine conservationists. The decision was made to public just 12 hours after Save Sharks Network Philippines posted a petition against shark fin transport at Change.org. “PAL takes the issue on protection and conservation of endangered marine life seriously, recognizing that the company’s long-term interest is and should be consistent with sustainable and responsible business practices,” the flag carrier said in a statement. This makes PAL the 18th international airline to adopt policies protecting sharks. Other airlines include Air New Zealand, Garuda Indonesia, KLM, Swiss, FinnAir, Lufthansa, Lan Chile / LATAM Airlines Group, Eva Air, Aeroméxico, Emirates, Korean Airlines, Asiana Airlines, Qantas & Air New Zealand. “The announcement of PAL is also a victory for all shark species who are brutally murdered for their fins. PAL, being Asia’s first airline and our flag carrier, will be taking a bold step and leading in marine conservation by ceasing the transportation of shark fins,” said Anna Oposa, co-founder of Save Philippine Seas and founder of the Shark Shelter Project in Malapascua Island. Save Sharks Network was in talks with PAL Cargo to discuss the issue in March 2014. With had no existing policies on shark fin transport, PAL promised to move internally to have rules in place. The airline said that they had no data that they were transporting shark fins because their cargo operations were outsourced. Earlier this April, Hong Kong-based NGO WildLifeRisk and a US-based NGO Fins Attached documented a large shipment of dried shark fins in Hong Kong. Checking the airway bill stickers, the shipment entered Hong Kong en route from Dubai on Philippine Airlines. “We are asking everyone to remain vigilant and make sure that PAL will honor its commitment and advise other airlines to adopt a similar shark ban to help save our marine ecosystem,” said Greenpeace Philippines oceans campaigner Vince Cinches. Seems like the heated exchange has since taken a friendly twist. ..